Workers are taking industrial action in support of their colleagues at a Limerick branch who they say have been ‘locked out’ for more than three weeks. 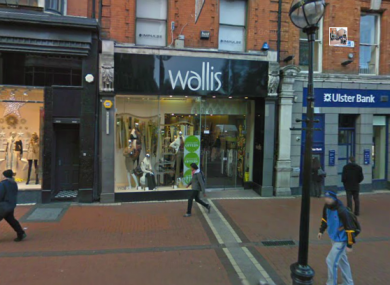 WORKERS AT THE Wallis clothes shop on Grafton Street are to go on strike in today in support of their colleagues at a Limerick branch who they say have been ‘locked out’ for more than three weeks. Employees at the shop on one of Dublin’s busiest shopping streets last night voted in favour of industrial action in the form of a picket on the store which begins at 9am today. Workers at a Wallis shop in Blanchardstown in Dublin also voted in favour of supportive industrial action last night. Mandate trade union says that the 17 workers in the Limerick store – who have a combined service at the shop of 240 years – were made compulsorily redundant several weeks ago, but that the owners, Arcadia Group, reneged on a long-standing redundancy agreement. The Grafton Street store is also due to cease trading this Saturday. A Mandate representative said workers will picket the Wallis store at Jervis Street in Dublin city centre once the Grafton Street shop closes on Saturday, and warned that the dispute may escalate to other stores. “Our members will not be broken by this company,” said Brendan O’Hanlon of Mandate. “We have members in all of Arcadia brands and they’re all fully aware that this attack on the Wallis workers’ entitlements is an attack on their entitlements too”. Retailing giant Arcadia Group also owns Topshop, Miss Selfridge, Evans, Dorothy Perkins and Burton Menswear. It is owned by businessman Philip Green. Workers have called on the company to attend the Labour Relations Commission in a bid to end the stand-off. Email “Employees at Wallis on Grafton Street to go on strike today”. Feedback on “Employees at Wallis on Grafton Street to go on strike today”.